Argento’s ‘Four Flies on Grey Velvet’: The Hitchcock – De Palma connection. 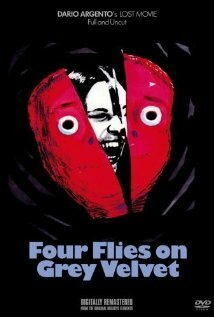 ‘Four Flies on Grey Velvet’ (4 Mosche di velluto grigio, 1971) marks Dario Argento’s 3rd instalment of his so-called animal trilogy that began with his directorial debut ‘The Bird with the Crystal Plumage’ (L’uccello dalle piume di cristallo, 1969) and followed by ‘Cat o’Nine Tails’ (Il gatto a nove code, 1971). Michael Brandon (perhaps best known for his role as Dempsey in the 80’s TV -show ‘Dempsey and Makepeace’) plays Roberto, a musician in a rockband, who’s being stalked by a man wearing sunglasses who he ‘accidentally’ ends op killing while a blackmailer is at the scene to take a photograph of it. A clear reference to Hitchcock’s ‘North by Northwest’ (1959) where Cary Grant is photographed with a knife in his hand standing over a dead body in the United Nations building. It has one of those insanely, completely ridiculous plots and is filled with trademark Argento visual setpieces that make his giallo films so pleasurable. If you only like films that work on a rational, plausible level please steer away as quickly as you can as it will leave you utterly frustrated. His movies only work if you understand they play in a dreamlike, nightmarish state. Which could off course be one way of justifying the overall bad acting many accuse him of. It also features Bud Spencer as a buddy of Roberto and Mimsy Framer (Road to Salina and Marco Ferreri’s Ciao maschio). The fact that it’s an Italo-French co-production helps to explain why Jean-Pierre Marielle is also appearing in the film. I already mentioned Hitchcock and Argento’s hommage to ‘North by Northwest’. To show it’s not the only Hitchcock inspired scene in the film I’ve prepared a clip with the Arbogast (Martin Balsam) murder from ‘Psycho’ (1960) followed by the Argento-like restaging of it for ‘Four Flies on Grey Velvet’. This brings us to the De Palma connection mentioned in the title of this post. De Palma is one of my favorite directors and one of his is Alfred Hitchcock. As did Argento, he’s learned his craft by studying the masters films and often pays tributes to him (or plainly steals as the De Palma haters would call it) in his movies. At times De Palma is also accused of ‘borrowing’ from Argento. Even though he confirms the kinship with Argento he is usually dismissive when it comes to being inspired by Argento. In interviews he claims to only really know ‘The Bird with the Crystal Plumage’ well. There are certainly hints of Argento’s debut that can be found in De Palma’s work but usually however fans are refering to the ‘Tenebrae’ (Tenebre, 1982) shot, where a protagonist kneels forward to reveal a killer standing behind him, De Palma copied for ‘Raising Cain’ (1992). For the 2nd comparison I’ve severely shortened both the parkbence scene from ‘Four Flies …’ and the museum sequence from ‘Dressed to Kill’ (one of the greatest and most cinematic scenes in movie history in my humble opinion). You will notice a couple of remarkable similarities. If you were to watch both sequences in it’s entirety they have a completely different feel to them but yet, the similarities are undeniable. There are some more scenes in the Argento film; e.g. where someone is making a blackmail phone call in a phonebooth while the camera pans of to a wire to desolve further to some more wire shots and telephone cables, that bare a resemblance to similar scenes in De Palma’s ‘Blow Out’ (1981) and ‘The Fury’. ‘Dressed to Kill’, even though its clearly more inspired by Hitchcock’s ‘Psycho’ and and the films of Buñuel (mainly Belle de Jour, 1967 and Un Chien Andalou, 1929), has a shot where the killer can be seen during a great crane shot, even though you will only spot on a 2nd viewing, as did Argento in Profondo Rosso (Deep Red, 1975). Though Argento revisits the shot in the end to reveal the killer in his typical fashion. Revisting shots and scenes is also one of the great trademarks of De Palma. De Palma to me is a far superior director than Argento but perhaps De Palma could perhaps start to give Argento his due where it’s due? < Previous The Green Inferno. Eli Roth’s ‘Cannibal Holocaust’ homage.